It’s just plain hard to wrap my mind around the fact that we live in a time where you can earn a lucrative income and get paid to copy and paste links. But here we are! Back in the day, when people wanted to refer an exceptional business to a friend, it was during a conversation, over a dinner or at work. Now with social media and the Internet so prominent in our daily lives, sharing your favorite business is just a link away. And businesses that are ahead of the game know that a referral from a friend is 100x better than a paid ad anyday. That’s why smart businesses set up easy to use referral programs where all you have to do is copy a link, paste it anywhere you want and if someone takes an action after clicking it, you get paid. Although the concept sounds simple enough, copying and pasting links for money is work. You see… If you truly want to get paid money just to copy and paste links there’s a couple hurdles you must get over. The links that you share to refer your friends or followers is directly associated with a particular business’s product. What do you know about that product? Is it something you’ve personally used? Or do you just want to make a quick buck? The answer to those questions will determine how genuine your message will be when you paste your link around the net. If you’re literally just copying and pasting links for no other reason than to get paid money, chances are you’ll fail to earn a single penny. I know I can’t stand it when someone is JUST trying to sell me something, but if they come at me with a real story about how a certain (Insert Product Here) helped them to (Insert Benefit Here), then I’m all ears. It’s of great importance that you select just one or two products to stand behind if you want to make money. So hurdle #1… Know the product personally and share it genuinely by telling your story. The link you’re sharing could be connected to the best product on the entire Earth, but sharing it with an uninterested audience will only hurt your credibility. For example: It would be pointless to refer a weight loss product link with a group of skinny people. The objective of pasting your link is to place it strategically in front of the most prospective customer who might want the product. That means dropping that weight loss product link where there are over weight people looking to melt some fat. So now instead of random copy and paste, you’ll need to dig a little and uncover online groups, forums, websites, etc. Places where your most likely condidate will be. Hurdle #2… Locate your IDEAL audience. Of course this isn’t set in stone. You may get lucky and paste the perfect link in the perfect place at the right time. And KAPOW! Your first sale! What I’m saying is that steady sales take time to build. It’s sort of like a snowball rolling down a hill. It starts small and as it collects momentum it grows larger and larger. But before anything happens you have to start it and give it a nice push. You’re not going to copy a single link, paste and expect that to be the end. For massive success, you have to copy and paste your link in multiple places; social media, blogs, comment posts, groups, classifieds, and more. Your goal is to get as much high quality traffic to your link as possible from people who need what you’re referring. This can be a tricky process for beginners, but can be learned with time and effort. I say this only because I don’t want you to feel discouraged if your first sale doesn’t come as quickly as you would like. Play a game with yourself where you allocate just 30 minutes a day to copy and paste a link in 5 different places. Commit to following through with this task for 30 days and watch as your sales begin rolling in. By day 30 you won’t want to stop. Does the link you’re copying and pasting require the person who clicks it to buy something for you to get paid? Or do they simply have to give their email address for you to get paid? Most people WILL NOT buy when they first visit a site. So if you want quick money for doing very little work, steer clear from asking your referrals to make a purchase. 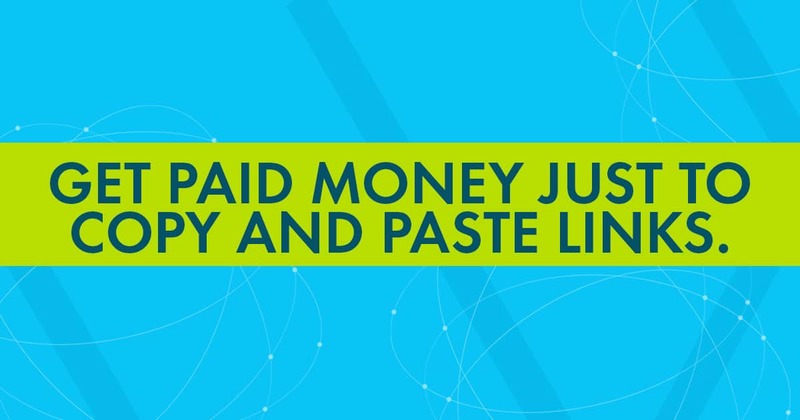 To hit the ground running, copy and paste links where you get paid money for signups. You may only earn $1 to $5, but there’s less commitment for your referral and believe me… Those dollars add up! You’ll attract a ton more people who’ll be willing to give up their email, rather than their cash. Better yet, if you can scrounge up a product link that’ll pay you for signups and sales you’ll be set for success. I recently joined a site called Earn Easy Commissions that does just that. They pay $2 for each qualified signup I refer and if the person actually buys, I get an additional $20. There are other sites online with a similar setup you just to do your research to find them. At the least, you should find companies that will pay you per referral signup. That will get you paid much quicker. But if you just have to go for the big sale it’s gonna take more than just copying and pasting a link. You’re going to have to write a longer story to sell your case. Posting an article, writing a thorough review, making a video, are all methods you can use to entice referrals to click your link. Without a good “above the rest” story sharing your positive experiences about the business behind your product link, your link will just blend in with the rest of the spam links on the internet. In conclusion– There’s thousands to be made getting paid money to copy and paste links. But just like anything else in life, it takes hard persistent work and a sliver of knowledge before earning a steady income. ← How to invest 1000 dollars and double it with cryptocurrency trading.